The resurgence of vacuum tube audio electronics in recent years has reignited a decades-old debate pitting one audio enthusiast against another. 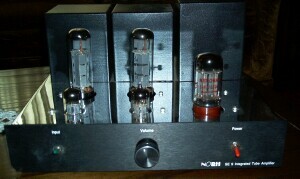 That is, which is superior for audio reproduction, vacuum tubes or solid state? After sampling numerous examples of both over the past few years, I have arrived at an answer to this debate - neither is better than the other. What? Heresy!! No, really! It isn't the amplifying device, it isn't even the topology, it is the design and quality of construction. I have noticed, however, that it seems to be easier to make high quality, excellent sounding vacuum tube amplifiers for a lower price than equivalent solid state. Oh, yes, you can buy consumer grade audio gear at a local electronics superstore, all of which tout at least 100 watts per channel and "less than 0.01% THD", but how do they really sound? The short answer is: most sound simply awful. No matter what the specifications, they are all built to a price. In order to include all the fancy consumer convenience features, builders must skimp somewhere, and it is always in the quality of the power supply and amplifier circuit. Pick a price, say, under $500 USD for an integrated amplifier, and what can you buy? In truth, not very much. Even Creek Audio's offerings start a couple hundred dollars higher. Solid state receivers and integrated amplifiers that cost under $500 USD are generally harsh and brittle sounding, and, despite the universally high power output ratings, choke easily under load, indicating that they often deliver only a fraction of their advertized power under real world conditions. In order to purchase a high-fidelity, or even mid-fi, solid state integrated stereo amplifier, an audio enthusiast is forced to spend somewhat more than $500. 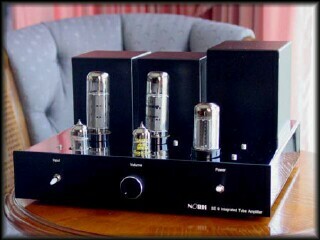 So, what kind of high, or mid-fi, vacuum tube stereo amplification system can be purchased for under $500? Actually, there are a few choices. In the U.S., there are two that come immediately to mind. The combination of the Antique Sound Labs AQ2004 preamp, at $299 USD, and a pair of ASL Wave 8 monoblocs, at $99 each, will cost just under $500. How do they sound? Pretty good, although the 10-watt, push-pull, pentode Waves have a tendency to be fairly bright and somewhat harsh in the high frequencies. Still, this combination easily sounds superior to any competitively-priced, consumer-grade equipment that I've heard. Then, there is the $499 Decware Zen Triode SE84C, a stereo, single-ended triode amplifier with a gain pot that allows its use with one source, no preamp required. The Zen has garnered a reputation for very high fidelity, often exceeding many amps that cost several times more. However, there is a price to pay - the Zen has less than 2 watts per channel, rendering it impractical for most commercially available loudspeakers. There is a new choice in the entry-level, high-fidelity audio market, the nOrh SE9. The nOrh Loudspeaker Company, a Thai-based company specializing in unusual-looking but highly effective loudspeakers, is also known for providing high-quality audio electronics at bargain prices. While nOrh produces their own loudspeakers, they purchase other electronics from lesser known manufacturers and market them through their very successful, web-based sales program. The practice of product rebadging has long been common for other audio manufacturers as well as manufacturers of virtually every kind of product. In the few short years that nOrh has been in business, they have not stood still and are continually offering new loudspeakers and new electronics to the public. Although all past preamps and amps offered by nOrh were solid state devices, in the last few months, nOrh has stepped into the valve equipment market with a vengeance offering vacuum tube versions of a phono preamp, two power amps, and a soon-to-be-released, active preamplifier. The first vacuum tube amplifier available from nOrh is the SE9, the subject of this review. This unit was difficult to obtain because the first batches of the SE9 sold out as fast as nOrh could provide them. At only $399 USD, the SE9 falls well within the price range of an affordable, integrated amplifier, and undercuts the price of the other two systems mentioned by about $100. What Is the nOrh SE9? The SE9, which is being produced to nOrh specifications by TS Audio, is a single-ended, integrated amplifier that uses one 12AX7 signal tube and one EL34 power tube per channel. The signal and power tubes are good quality, Electro-Harmonix tubes. Power rectification is handled by a Chinese-made, 5AR4, full-wave rectifier tube. The large power transformer is located on the back, right side of the chromed steel chassis; the two output transformers are located on the back of the chassis to the left of the power transformer. All three transformers are fully potted. The ceramic tube sockets, which are not easily visible, are mounted on the main circuit board within the chassis. Two switches and a single knob are placed on the front panel: the input selector switch is on the left; the volume knob for the Alps pot is located in the center; and, the power switch is located on the right. The SE9 has two inputs controlled by the toggle switch on the left side of the front panel. The input RCA jacks are located on the back panel of the chassis. The IEC plug for the detachable power cord is also located on the back panel. Speaker binding posts are placed on top of the chassis near the back edge, just behind the output transformers. The SE9 has both 4 ohm and 8 ohm output taps. All connectors on the little nOrh are gold-plated, unlike budget tube gear of the past. The chromed steel chassis is rectangular in shape, approximately 30.5 cm (12 in.) wide, 26.7 cm (10.5 in.) deep, and weighs 14kg (31 lbs). A black anodized, brushed aluminum plate forms the front panel. The switches and knob are identified and the nOrh logo with model name, "nOrh SE9 Integrated Tube Amplifier" placed on the lower right of the front panel. Most of the internal electronic parts, including the tube sockets, are located on a circuit board. 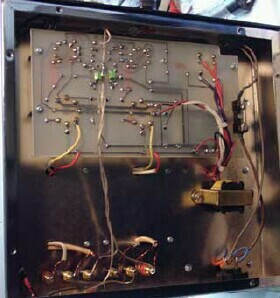 Due to the circuit board spacing from the top portion of the chassis, the tube sockets are recessed beneath the top of the chassis. Aesthetically, this gives the top of the amp a very clean appearance as the bases of the tubes are slightly recessed below the top of the amp. nOrh's goal with the SE9, which has been stated on their website and on the Harmonic Discord nOrh Forum, was to produce a low-cost amplifier with high end sound quality and enough power to adequately drive many available loudspeakers. This goal dictated that the SE9 should produce more than the 2 or 3 watts typical of many high-end, single-ended amplifiers. As such, although the SE9 uses single-ended topology operating in pure Class A, the EL34 tubes are wired to operate in pentode mode providing 9 watts per channel. No global negative feedback is used. Power consumption of the SE9 is 80 watts. The preamp section is passive. The SE9 has a clear, musical presence usually associated with single-ended amplifiers - even at low volume musical notes seem round, natural, and full of the 'color' one expects from music. Most amps in the SE9 price range tend to deliver sound that is bright, harsh, and lifeless. In addition, solid state amplifiers usually sound dull or 'gray' at low volumes needing higher volume levels to 'come to life'. However, as with many other single-ended amps, the SE9 can be played at very low volumes while maintaining its rich, musical output. This is a great advantage when using the amp in places or at times when low volume is desirable or necessary. The bass output is quite strong with no apparent low end rolloff, at least to the lower limit permitted by loudspeakers available for this review (into the low 40Hz range). The SE9 provided good bass driver control with most speakers tried, including nOrh SM5.1 and 3.0, Omega TS1, TS2R, and TS3, and the Hornshoppe Horns. Bass was clear and quite well-defined, although the SE9 had difficulty with some bass transients, particularly on larger, less efficient speakers. When using higher efficiency or single-driver speakers, such as the Omegas or the little nOrh 3.0, bass was much better controlled. 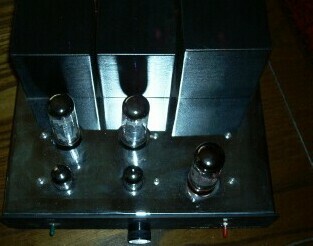 As is true of most single ended tube amps, bass control is not as good as with most solid state amps. However, typical of single-ended amplifiers, the mid-range is where the SE9 works best, allowing most instruments and vocals to sound natural and clear in a way that competitively-priced, solid state equipment usually cannot. With properly matched speakers, vocals and acoustical instruments are delivered beautifully. High end extension was also very good as the SE9 delivered strong, clear, and undistorted high frequencies. Unlike most single-ended triode amplifiers (SET), the pentode connection of the SE9 provides enough power for this amp to satisfactorily power far more commercially-available speakers than can most SETs. Numerous speakers that the Decware Zen (at only 1.8 wpc) cannot drive to satisfactory listening levels can be powered by the SE9. Two examples that were tested included nOrh's own SM5.1s and B&Ws DM602. While the Zen amp produced excellent sound when driving either pair, volume was restricted to very low levels, or the Zen would compress dynamic range, then begin to clip. The SE9 could drive either speaker to uncomfortably high levels before clipping could be induced (over 90dB average in a room that measures approximately 140 cubic meters, 4030 cubic feet). When using the 4 ohm tap of the SE9, a pair of Reynaud Twins could be driven to reasonably high listening levels without clipping or compression. Having a full 9 watts per channel can deliver surprising results. The strongest and most positive aspect of the SE9 performance is in the midrange, allowing vocals and acoustical music to take on an almost living presence. This is often true of single-ended amps, and the SE9 is quite capable in this regard. While the SE9 is happiest with jazz, blues, folk, and other types of acoustical music, it is also capable of driving efficient speakers (94dB or over) to nearly life-like levels with more dynamic music, such as Stravinsky's Firebird Suite. Given appropriate speakers, the SE9 can also deliver rock music to very high levels, although not, perhaps, as high as some rock fans would prefer. The SE9 is a very quiet amplifier. Comparisons with several other available tube amplifiers revealed that it was as quiet as the Zen Triode, and much quieter than a Fi X - despite the fact that the Fi cost three times more and had only 1/3 the output power. A few other tube amps near the price range of the SE9 were available for brief comparison. The Antique Sound Labs Wave 8, which is a push-pull, monobloc design with 10 watts, sounded harsh, gritty, and vaguely unpleasant compared to the SE9. The closest amp available in design and specifications to the SE9 was an Antique Sound Labs MGSi15 DT, single-ended pentode/triode amplifier. This ASL is an integrated amp that uses a single KT88 per channel. While this amp delivers almost twice the power of the SE9 in pentode mode, the sound quality seems a bit less refined, with harsher treble and slightly less detail. In addition, it costs $749 USD, not including shipping - almost twice as much as the SE9. The build quality of the SE9 is exceptional, especially given the price class in which it competes. For the same price as plastic, inexpensive, light-weight, consumer-grade electronics, the SE9 weighs 14kg (31 pounds), owing largely to its huge, potted power and output transformers. The chrome plated chassis is very well-finished. The overall aesthetic effect, particularly with the unit on and the glowing tubes reflected in the chrome, is that of high quality and higher price. nOrh Loudspeakers has a reputation for exceptional customer service. The sample amplifier is a perfect example. While a sample of the SE9 had been promised for review for a few months, nOrh was busy fulfilling customer orders. Finally, a customer received an amp that had been badly damaged by the shipper. That amp was immediately replaced with a new one, and the damaged one shipped to me for review. Despite the abuse to the amplifier, including a bent front panel and twisted chassis, the only functional damages to the amp were the two switches on the front panel. 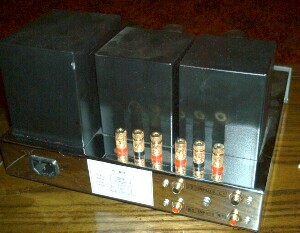 After replacing these, the amplifier worked perfectly, despite my repeated abuses. The SE9 carries a one-year warranty for parts/labor, excluding tubes. The SE9 is easy to use. It has only two inputs controlled by a single toggle switch. The power switch is on the front of the chassis, and the speaker posts are well-labeled and easy to access. Most important for ease of use is that the SE9 is self-biasing, which reduces maintenance. This is an important consideration, especially since many SE9 purchasers will be first-time tube equipment buyers. While high frequencies are quick and well-defined, they tend to sound somewhat grainy and a little sharp-edged compared to most single-ended triode amplifiers. This characteristic isn't readily apparent during casual listening, and is not very noticeable on its own. However, when comparing the SE9 to a directly heated triode, like a Fi X 2A3 amp, the difference becomes apparent. There is a liquid-smooth and satisfying tonal quality to a triode amplifier that cannot quite be matched by the SE9. However, it must be remembered that the referenced Fi X amplifier cost three times more than the SE9. When compared to the Wave 8, the single-ended character of the SE9 is very clearly defined and superior in every respect. While bass was generally well-controlled with efficient speakers, less efficient speakers showed up a general weakness in the bass. For instance, when paired with nOrh SM6.9 loudspeakers at low volumes in a quiet environment, the SE9 sounded rich, sweet, and clear. However, when the volume was elevated to higher levels (mid-80 dB range), control diminished allowing bass to sound soft and boomy with overhanging transients. Clearly, the SM6.9 is a poor match for the little SE9. In fairness to the SE9, the only tube amp I have used satisfactorily with the SM6.9 was a modified Dynaco ST70, which had a power output of 35 wpc. With any speakers that were not efficient enough for the volume level played, the SE9 would begin to compress the dynamic range and muddy the details, just before clipping set in. In such circumstances, the only solution is to play the music at a lower volume. The SE9, as with most single-ended amplifiers, works best with more efficient loudspeakers, particularly single-driver varieties. The best-sounding speakers tried with the SE9 were a pair of Omega TS2R speakers, which allowed very good bass control while delivering wonderful mid-range and clean treble. A pair of Hornshoppe Horns also worked well and could be pushed to ridiculously high (and painful) sound levels. However, while bass was cleaner and better defined than with the Omegas, the Horns delivered a harsher, edgy high-end with the SE9 making them less enjoyable. nOrh's 3.0 speakers also worked very well, delivering wonderfully clean and clear mid- and high-frequency performance, but lacked lower bass. When combined with a subwoofer, the 3.0s would be an inexpensive and very effective choice for the SE9. When the 3.0s were combined the new Hornshoppe subwoofer, the Hornline, they blended seamlessly producing great clarity, frequency range from 30 Hz into the high frequencies, and wonderful, pinpoint imaging, a quality often noted with nOrh drum speakers. nOrh recently developed its own high efficiency speaker, called the Pyramid, that uses four 3-inch, full-range drivers (the same drivers as used in the 3.0) arranged in a radial array, providing 94dB efficiency without a crossover network. Unfortunately, the Pyramids were not available for trial with the SE9. The speaker binding posts are fairly small by today's standards. They will allow banana plugs and medium-sized spades. However, there isn't much room to connect a second cable on each post, such as a high-level line for a subwoofer, when a spade is attached to the post. The tube sockets are recessed below the top of the chassis. This prevents the use of wide-base tubes, including some vintage EL34 and rectifier tubes. This is only a minor inconvenience as there is a wide selection of new and NOS tubes available that will fit the SE9. As with most vacuum tube power amplifiers, the SE9 runs quite warm. It does not run as hot as some, such as a Dynaco ST70, but it does produce substantial heat. There is no protective cage available for this amplifier. While this likely will not be a problem for most people (indeed, I much prefer running a tube amp without a cage), those with young children or nosy pets must be certain to place the amp where inquisitive fingers and noses cannot reach. So what is the SE9? It is a single-ended pentode, with a sonic signature very similar to a single-ended triode, but with some differences - while it doesn't quite have the liquid-smooth character or the exquisite detail of many SETs, it has much more power. The sound quality approaches high end, but the price is definitely low end. Despite the price, the construction quality and finish are excellent. Comparing the SE9 to SET amps costing 3 to 5 times more, there are minor shortcomings in sound quality. Most notably, the perception of palpable reality is slightly less potent and the upper mid-range and treble tends to be harsher with the SE9 than with some SE triode amps. However, since the SE9 has substantially more power than most affordable SET amps, the flexibility of speaker selection may be a very important consideration to many potential buyers. When compared to other amps in its price range, and many much more expensive ones, the SE9 produces sound quality that leaves most competing products, whether tube or solid state, far behind. The SE9 is being marketed by nOrh to bring high end sound to the entry level market. This amp does precisely what nOrh wanted it to do: it combines very good sound with surprisingly high quality construction into a package that is aesthetically pleasing and easy to use. And, it does so at a price that makes it attractive not only to first time buyers looking for an affordable way into the high end market, but also would make an attractive amplifier for an audiophile with a need for a second, less expensive system. The SE9 is a winner, pure and simple. After spending some time with the SE9, it comes as no surprise that nOrh cannot keep this bargain-priced little amp in stock. Thank you very much for your very positive review of the SE 9. I believe that your review is quite detailed and quite accurate. We now use an Electro Harmonix rectifier tube instead of the Chinese tube. As far as I can tell, this doesn't make a huge difference in the sound but I do believe the EH tube is more aesthetically pleasing. nOrh Loudspeaker wanted to create the SE 9 as a fun amplifier for people who have either never been interested or given up on good quality sound. We wanted to make the amplifier easy to use, attractive and great sounding. It was not designed to be the amplifier that provided the definitive answer to whether tube or solid state amplifiers sound better. It was designed to offer a level of sound that simply has not been available at the price. 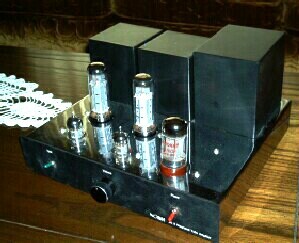 I believe that the sound of the SE 9 amplifier is equal to just about any SE amplifier using EL34s. Because it is a passive preamplifier, an active preamplifier combined with the SE 9 would give better sound. This is what we offer in the SE 18, more power, integrated active preamplifier and a phono preamp. The SE 9 can be used with an existing active preamplifier with very good results and perhaps even an improvement in sound. I am very pleased that you believe that we sound better than anything else in the price range. In fact, we are quite pleased to know that even at twice the price, there doesn't seem to be anything better -- except our own SE 18. Some photographs used in this review were provided by nOrh Loudspeakers. All remaining photos by Richard George.